This paper has two main objectives. First, it intends to investigate the differences in ethical ideology between accountants and accounting students. Second, it aims to examine the differences in the ethical judgments in general situations and based on the legality of the situations between the two groups. Using a questionnaire survey that comprises Ethical Position Questionnaire (EPQ) and ethical dilemma vignettes, a total of 617 usable responses were received comprising of 396 and 221 responses from accountants and accounting students respectively. In achieving the objectives, independent t-tests were also performed. The results reveal that there are significant differences in the idealism ethical ideology between accounting practitioners and accounting students. It is also discovered that there are significant differences in the ethical judgments between the two groups of respondents for overall vignettes as well as for illegal ethical vignettes. ISMAIL, Suhaiza. 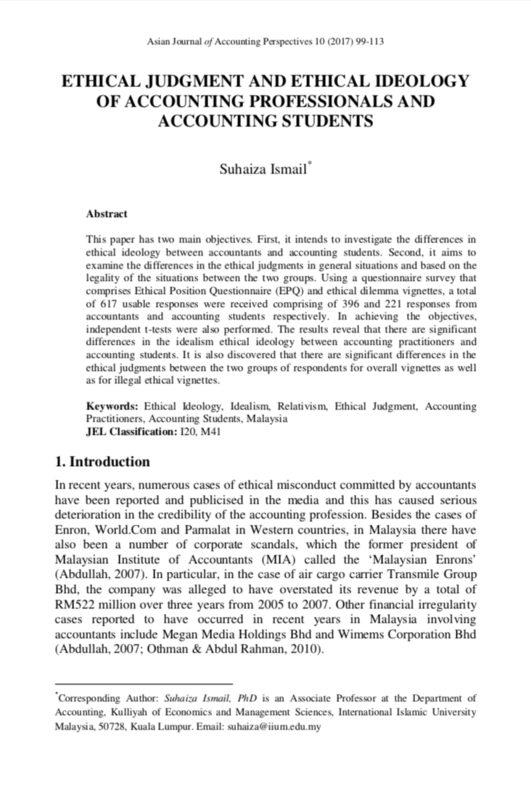 Ethical Judgment and Ethical Ideology of Accounting Professionals and Accounting Students. Asian Journal of Accounting Perspectives, [S.l. ], v. 10, n. 1, p. 99-113, dec. 2017. ISSN 0128-0384. Available at: <https://ajap.um.edu.my/article/view/11283>. Date accessed: 23 apr. 2019.